U.S. President Barack Obama lectures the White House Summit on Countering Violent Extremism in Washington on February 18. On February 18, the White House hosted a three-day summit on "Countering Violent Extremism" to "counter hateful extremist ideologies that radicalize, recruit or incite to violence." Great care was taken by the Obama administration to avoid any mention of words associated with "Islam" or "Muslims". Thus, "violent extremism" became the catch-all phrase to refer to Islamism, Islamist or Islamic extremism during the conference. It soon became evident the three-day summit was a theatre of the absurd. The very people who have preached Islamism and promoted sharia in their sermons were invited to recommend how to undo the damage done by their teachings. Conspicuous by their absence at the summit were prominent Muslims who have been fighting the doctrine of the Islamic State. Imams from American mosques that practise gender segregation and homophobia, representatives of Gulf Arab states who funded and promoted the ideology and the government of the Taliban in Afghanistan, and women sporting Muslim Brotherhood-mandated hijabs dotted the audience and speakers. Conspicuous by their absence at the summit were prominent Muslims who have for the past decade been fighting the doctrine of the Islamic State (ISIS), which was the real focus of the conference. 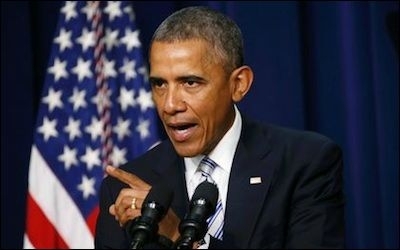 [Obama] is insulting millions of reform-minded Muslims who are trying to reject and push back theocracy ... And the leader of the free world in the meantime is saying, 'Well, these terror groups are sort of coming out of thin air and it's just sort of a crime, education and a job problem'--which is absurd. Defeating ISIS might have been the stated intention of White House officials, but they did not find it worthwhile to talk to the only groups that have defeated Islamic State on the battlefield. Those are the fighters of the Kurdish Workers' Party (PKK), which the U.S. considers a terrorist organization, and their Syrian allies, the Yekîneyên Parastina Gel (YPG). Rotterdam mayor Ahmed Aboutaleb has condemned Dutch Muslims who refuse to integrate into their host society. 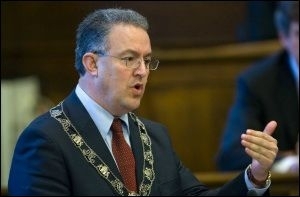 Another Muslim politician who should have been at the table was Ahmed Aboutaleb, the outspoken Muslim mayor of Rotterdam in the Netherlands. Born in Morocco, Aboutaleb first came into the international spotlight when he addressed Dutch Muslims on a Dutch TV network following the Charlie Hebdo attack saying, "if you do not like it here ... may I then say you can f... off." Aboutaleb, who spent 15 years in Morocco living off "one meal a day," and "walking without shoes" took a stab at the Obama administration's suggestion that a growth in job opportunities may reduce radicalization. "I know how it is to be a product of poverty, and I cannot accept that poverty leads to terrorism," he said. "Poverty must lead to a seek to knowledge, to sciences, to be better, to climb on the social ladder..."
The frustration of anti- Islamist Muslims was best reflected in the headline of an essay by two American Muslim feminists, Asra Nomani and Hala Arafa, that appeared in The Daily Beast days after the White House conference ended. The headline read: "Will It Take The End of the World For Obama To Recognize ISIS As 'Islamic'?" My fear is by the time America wakes up to the reality of the Islamic State, it may be too late to stop them.